David Glawe, undersecretary for intelligence and analysis at the U.S. Department of Homeland Security (DHS), and Hayley Chang, DHS' deputy general counsel, told the Senate committee that oversees the department that it needs new authority. "Terrorist groups overseas use drones to conduct attacks on the battlefield and continue to plot to use them in terrorist attacks elsewhere. This is a very serious, looming threat that we are currently unprepared to confront," the officials' written testimony said. A bipartisan group of senators including Senate Homeland Security Committee Chairman Ron Johnson, a Republican, and the committee's top Democrat, Claire McCaskill, last month introduced legislation to give DHS and the Justice Department authority to "to protect buildings and assets when there is an unacceptable security risk to public safety posed by an unmanned aircraft." "The federal government does not have the legal authorities it needs to protect the American public from these kinds of threats. The threats posed by malicious drones are too great to ignore," Johnson said. The American Civil Liberties Union said in a letter to the committee that it opposes the bill, which "amounts to an enormous unchecked grant of authority to the government to forcefully remove drones form the sky in nebulous security circumstances." FBI deputy assistant director Scott Brunner told the committee the agency is "concerned that criminals and terrorists will exploit (drones) in ways that pose a serious threat to the safety of the American people." 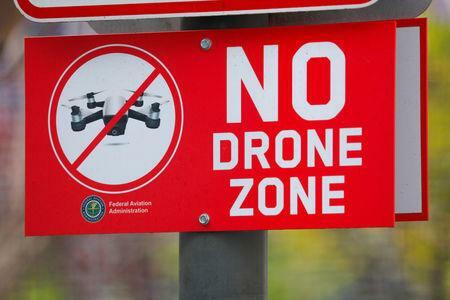 DHS said despite upgraded security efforts in U.S. capital area, "we are still experiencing (drone) incidents ... that require an appropriate response - even if they are nuisance or non-compliant operators who disregard the rules."